Building up Families in Burlington: The Prairie Family Center in Burlington serves as a beacon of hope for local families, pairing them with vital community-based resources to help them thrive. Planting Seeds of Health in Antonito: The Antonito School and Community Garden offers fresh, nutritious foods and is helping to create healthy connections for the entire community. Committed to Health in Rocky Ford: At Rocky Ford Family Health Center, Doug Miller’s commitment to his community is changing the way he cares for patients by expanding services to integrate behavioral health care. 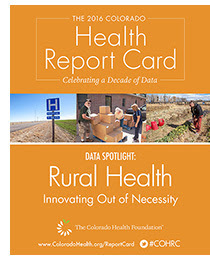 Developed in partnership with the Colorado Health Institute, the Rural Health Data Spotlight takes an in-depth look at health in rural regions of the state and emerging solutions to overcome unique challenges. Read County Spotlights to learn more about health in your community. Join the conversation on Twitter by using the hashtag #COHRC.